Impact index. Updated normalized score. Market coverage. Replace by a new metric Market strategy: Granted expired patents are now included in the calculation. Strength index. New score available for both alive and dead patent families. Value index. Normalized score and a new remaining life factor. Score based on the number of forward citations received by the analyzed patent families, corrected to account for age and technical domain. The calculation method for impact index remains the same but the results have been normalized so that an average patent family now has a score of 1, making it easier to identify whether the portfolio you’re analyzing scores above or below the average. Score based on the GDP of the countries where the analyzed patent families are granted or pending. Previously, as soon as a patent within a family expired, we remove the GDP associated with the expired country from the score. This made it difficult to answer questions like « Does my competitor tend to protect in a larger overall market than me? » because patents which were granted in a country but have since expired were removed from the calculation. Now we keep countries with expired patent rights in the calculation, as long as they were at one point granted. Single score which combines the results of impact and market strategy indexes. Score based on the number of forward citations, the GDP of the countries where the analyzed patent families are granted or pending and remaining life of those patents. The patent value index has been updated to include a remaining life factor in the calculation method. The calculation will now be weighted based on the maximum possible remaining life of the patents within the family. As with the impact index we have also normalized the results so that an average scoring patent will have a patent value score of 1, making it easier to identify whether the patents you are analyzing score below or above average. The sum of all the patent value scores for all patents in the analyzed portfolio. As the patent value calculation method has been updated, the portfolio value results will also change accordingly. 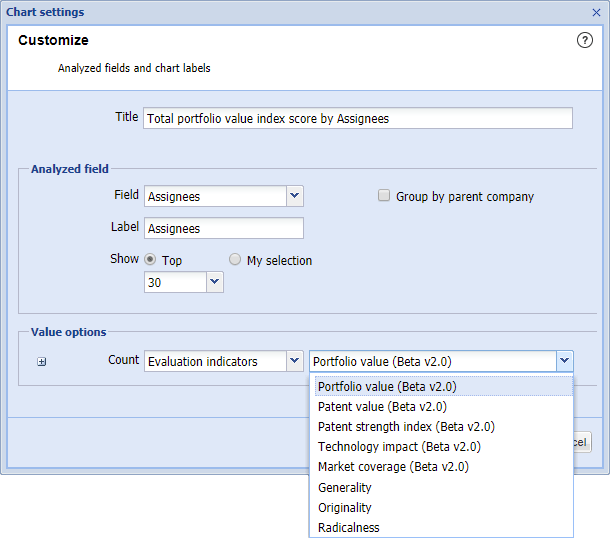 To access the patent value indexes, you need to create a new saved analysis and then select the new value indexes from the settings menu.